Pauline Roberts was born October 1, 1896 in Deering ME (now part of Portland), to George and Nancy Kimball Roberts. Her maternal grandparents were the well-known Maine landscape artist Charles F. Kimball, and artist Annie Kimball of Portland ME. Her uncles became well-known contractors who built many homes in Portland, installed many of the stairs in the forts in the Portland area, and built the stairs to Portland City Hall. According to her son Noyes, "She told me once she had a ride in the first licensed touring car in the streets of Portland when she was 5. She said it scared the horses." After she graduated from Deering High School in 1915, she studied elocution and music. 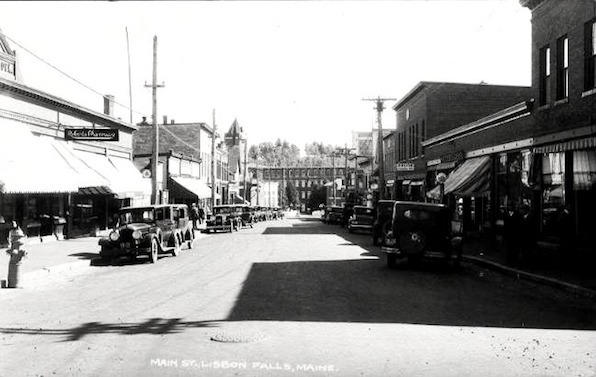 Three years later, in 1918, the Roberts family moved to Lisbon Falls ME, when her father, a pharmacist, bought the local pharmacy, renaming it Roberts' Pharmacy. 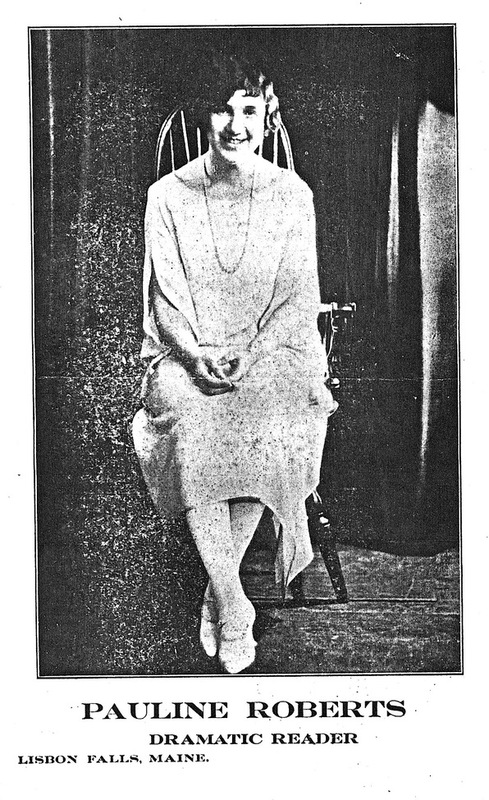 In 1918, she attended the Leland Powers Dramatic School of Boston. When she completed her studies there, she joined the Rice Summer Stock Theatre Company on Cape Cod for one summer, working there as a character actor. Her love of drama led to an acting career, her forté being one-woman shows, playing all the characters in a play. She specialized in Irish and Italian accents. She had a beautiful voice and was much in demand for both her acting and her singing. Soon after returning to Lisbon Falls, Pauline Roberts started a local acting troupe that performed for local clubs and organizations. Later, she taught public speaking and voice at Lisbon High School for many years, as well as elocution and expression at the Philharmonic Studio in nearby Auburn ME. On March 6, 1927, she married Arthur Noyes Lawrence at the Portland New Church in Portland ME. Arthur Lawrence was born October 5, 1900 in North Yarmouth ME. He was a 1923 graduate of the UNH College of Agriculture in Durham NH where he then taught animal husbandry for two years. In 1925, he moved to Portland ME to study pharmacy. After their wedding in 1927, Arthur worked under the tutelage of his new father-in-law at Roberts' Pharmacy. When he became a registered pharmacist in 1928, he joined the family business as Mr. Roberts' assistant. 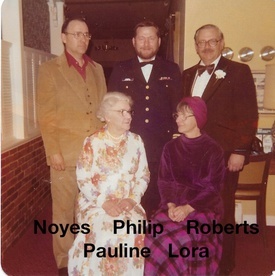 Pauline & Arthur had four children: L. Joanne (1929), Roberts K. (1930), A. Noyes (1932), and Philip G. Lawrence (1936). When her father died in 1948, Pauline Lawrence became the sole owner of Roberts' Pharmacy with her husband Arthur as the only pharmicist in town for the next 14 years. The Lawrence family summered at Locust Ledge Farm in Freeport ME from April through October each year, where Pauline had a large garden, from which she canned and sold large quantities of vegetables. She also spent a lot of time writing to local legislators about environmental issues. 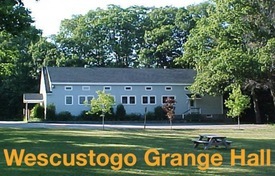 She sold the Freeport property in 1963. After 36 years of marriage, her husband Arthur died at age 62 on August 14, 1963 when Pauline was 65 years old. His eulogy was delivered by FNCA co-founder, Rev. Louis A. Dole. Pauline Lawrence would continue on in this world for nearly 3 more decades. 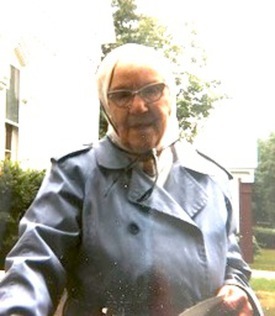 After her husband died, she ran Roberts' Pharmacy for 13 more years before selling it to her second son, A. Noyes Lawrence, also of Lisbon Falls, in 1976. Her son went on to run it for another 13 years after that before closing Roberts' Pharmacy in 1974. As a widow, when the subject came up, Pauline Lawrence let those around her know she was very much looking forward to joining her husband in the next life. Pauline Lawrence was an active member of the National Federation of Business and Professional Women's Clubs; a member of the Wescustogo Grange of North Yarmouth ME for 79 years; an active member of the Lisbon Falls Library Association; a member of the local chapter of the Order of the Eastern Star in Lisbon Falls for 50 years; and at the end of her life was the oldest member of the Lisbon Shakespeare Club. 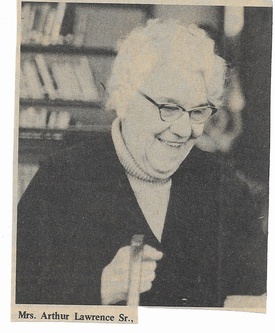 Pauline Lawrence was not just "a member" of the Lisbon Falls Library Association, but instrumental in establishing the Lisbon Falls Community Library in the first place. In the late 1920s, before the Great Depression hit, Pauline and her friends decided the town needed a library. They culled their private collections and, between them, donated several hundred volumes to start a library themselves with a part-time librarian who kept track of the borrowing with handwritten entries in a notebook. Soon, they had a library association consisting of about 100 local citizens and teachers. This group held many fundraisers for the library, including monthly suppers with food mainly grown, cooked, and served by Pauline Lawrence herself. One year, they put on a vaudeville show that ran two nights to standing room only audiences. It consisted of several one-act plays (remember: Pauline was an actress), and Slovak skits and dances. When the Worumbo Mill closed its Co-operative Store on Main St. in Lisbon Falls, the building was used as the local community center, and when the mill closed for good in 1964, the building was given to the town for use by the library. The Library Association figured that about $20,000 (nearly $165,000 in 2019 dollars) was needed to refurbish the building and to buy bookshelves and library equipment. In March of 1964, Pauline Lawrence made a motion at the town meeting for a $20,000 loan, which the town agreed to... as long as the Association members secured the loan themselves! The Library Association, of course, agreed. 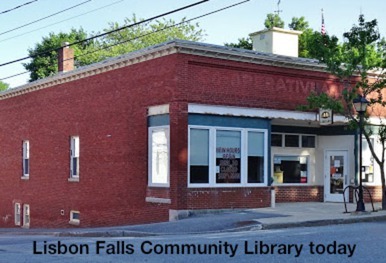 All the needed work on the building was done by volunteers, and a pledge drive and additional fund raisers allowed the Library Association to repay the town in good time. 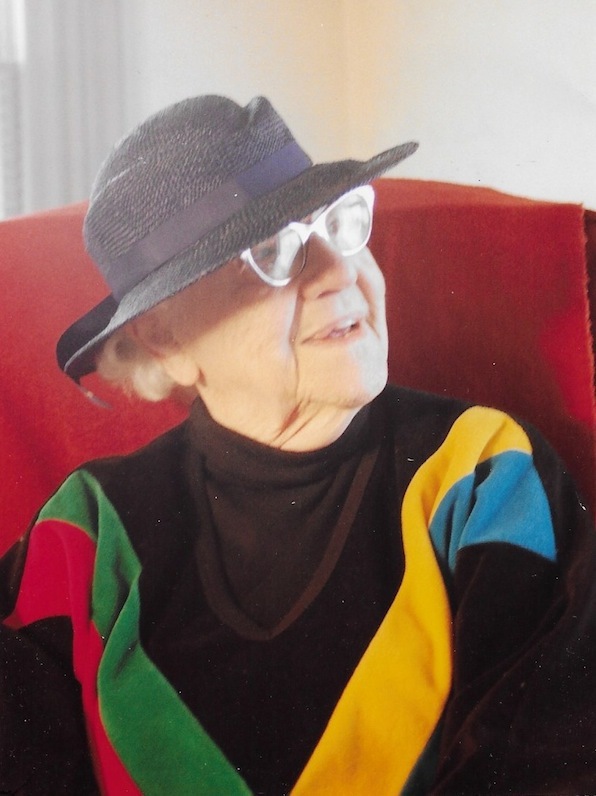 From its earliest beginnings, through its acquiring a building, then becoming an official town department, and finally growing into the full-service library it became during her lifetime, Pauline Lawrence was active in promoting and supporting the Lisbon Falls Community Library for over 60 years. In fact, the Library was so important to her that when she died in 1992, her family immediately established an endowment in her name to purchase reference books for the library. So at her funeral, it was requested that donations be made to the "Pauline R. Lawrence Memorial Fund". This endowment is still active to this day. In 2019, Lisbon Falls Community Library director, Diane Nadeau, said, "Many wonderful sets of encyclopedias, medical and legal reference books have been added to our collection in memory of Mrs. Lawrence." 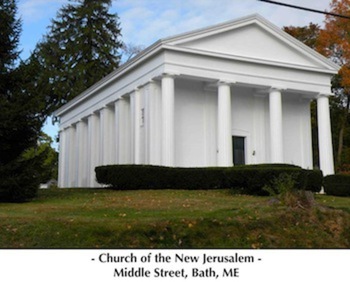 During her childhood in the Portland ME area, Pauline's family attended the Portland New Church. From an early age, Pauline's interest in Swedenborg was fostered by her maternal grandmother, Annie Kimball, whom Pauline adored. Annie's love for the Writings became Pauline's love, too, and she became a life-long advocate for them. When the family moved to Lisbon Falls ME in 1918, Portland was 30 miles away, a bit far for a weekly drive back then, so they weren't able to attend church services there regularly any more, although anecdotal evidence suggests that they still attended sporadically as well as special events. And in 1927, Pauline and her husband Arthur were married in the Portland New Church. In 1929, just two years after their marriage, Arthur joined the Church. In 1937, the Lawrences were delighted when the Church of the New Jerusalem in Bath ME, only about 15 miles from their home, reopened. They transferred their membership to the Bath Church and attended services and other church events there regularly from then on. Pauline Lawrence was also a Life Member of the Swedenborg Foundation. We must practice love to the Lord and love to the neighbor in our daily lives. We must keep our channels clear and pray to be given the right words to say when a friend asks a question about religion. We must watch every day of our lives for a chance to pass along some truth to those with whom we come in contact. We as individual members of the New Church must stop being passive. We all know that it is a great privilege to have access to the teachings of Swedenborg, so let us make the most of this great opportunity and share them. Let every one of us act this New Year! Pauline & Aurthur Lawrence first attended the FNCA on their honeymoon in 1927, and attended every single year after that until death or failing health prevented them. For many years, Pauline had wanted to have a cabin built. In 1963 when her husband died, she came into a small inheritance from his life insurance and built the Lawrence Cabin for $2,700 (about $22,000 in 2019 dollars). 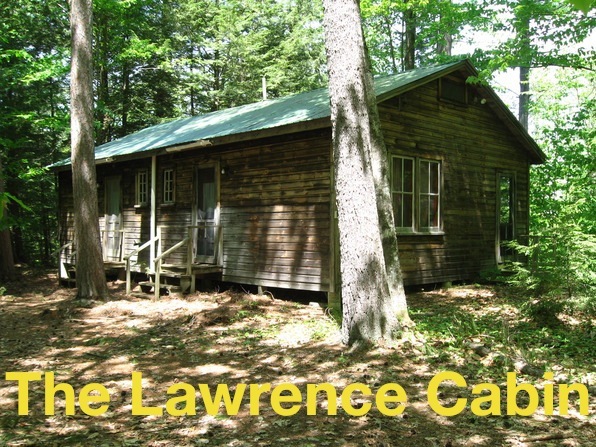 The Lawrence Cabin is a double cabin that can house two families, one at either end, with a long shared porch. Shortly after it was built, a huge pine tree brought down by a major wind storm came crashing down on the roof, splitting the entire cabin in two all the way down to ground level. Luckily, no one was living in the cabin at the time. Pauline's son, Noyes, quotes her as saying, "the nice man from Fryeburg who built the cabin did put it back together again." © Anna Woofenden 1980From then on, she was able to enjoy her 3 weeks at camp every August in the Lawrence Cabin. Actually, she often lived in the Lawrence Cabin May-September for another 15 years until failing health started keeping her away in the late 1970s. Her last year at the Assembly was in 1986, at the age of 90, when she attended with the help of family and friends. Since then, her children and grandchildren have attended and enjoyed the FNCA on many occasions. Throughout her life, Pauline was known for her quick wit and her sense of humor, as well as her honest frankness and cheerful kindness to all. After her husband died in 1963, she was also known for inviting young women who needed shelter to stay in her home. A positive spirit, wonderful sense of humor, and good will are apparent to anyone first meeting Pauline Lawrence. "I've always looked forward to everything, always looked forward to life. I guess I've always been a positive person"
"I'll help you in any way I can," she said as we were saying our goodbyes. The honesty in her eyes made me respond, "I know you will." All of us like to think we have the opportunity to make our mark in the world; leave it a better place than when we started. Few of us manage to produce the kind of change that results in a tangible, valuable legacy for generations to come. That is the kind of contribution Pauline Lawrence made when she and a group of friends decide to start the Town library. She loved the White Mountains, the Saco River, and discussing the Writings and rapping with her New Church pals. ...Her articulation was never in doubt. Her mind was always as "Sharp as a Tack". After a brief illness, Pauline Lawrence died on Sunday, June 21, 1992 in Lewiston ME at the age of 95.